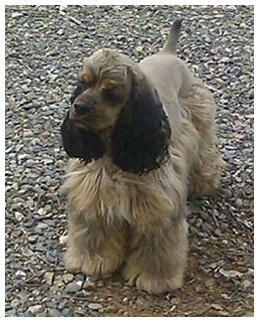 Sable cockers have always been a part of the cocker spaniel breed. Sable can be found in the Springer Spaniels and English Cockers as well; which is where our American Cockers derived from. It has also been one of the hottest "color" topics and color wars in the history of the cocker spaniel. The sable pattern has been traced back into the early 1900's, where many were registered as mahogany, and some were registered as sable. In the early AKC stud books, the breeder/owner could register a dog whatever color they wanted to. 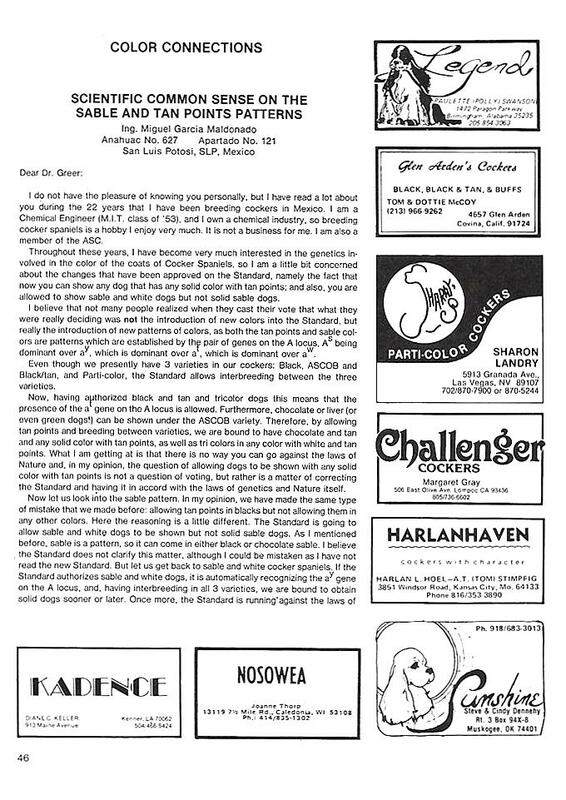 In other words, there were no set colors or patterns as per the standard they had to go by when registering a color or pattern at the time. So often, you would see many different colors and markings listed than what you see today through AKC. old AKC stud books, had been changed to red by AKC in a online pedigree search at AKC. Sable is NOT a rare "color" like some say. It just isn't bred as often as the normal colors by the show community. Many show breeders still have and breed sables, even though they cannot be shown in the USA. Sables are still being bred and can still be shown in conformation in Canada and other countries. But because of the American Spaniel Club, the AKC will not allow the sables to be shown in the USA. They can still compete in performance, and many have achieved performance titles. Some show in conformation at United Kennel Club (UKC) shows and others go up to Canada to get their conformation title. Another problem, is sabling is considered a pattern, like the roans etc. But it is listed as only a color with AKC. This needs to be addressed and changed as there are red sables, brown sables, black sables and clear sables. There are also sable roans. There are no health problems associated with the sable pattern. The Sable gene is on the same locus (genetic marker) basically as the tan point gene. The dog has to have this sable or tan point gene or carry it in order to produce sable. They are represented as "ay" and "at". If a dog has 2 ay "genes" it will be what people call a clear sable; and really won't appear to look sable..it will basically look like a buff. If it has 2 "at" genes, it will be tan pointed ( e.g. : Black & Tan); If the ay "gene' pairs up with the "at" gene, then the dog will look and be sable. If a dog only carries 1 "at" gene, it will not look tan pointed, but it WILL carry for the tan point gene. This is why you can breed a sable to a solid dog or a dog that doesn't have tan points, but does carry for them (e.g. has a parent who is tan pointed) and be able to produce sable. You cannot breed 2 tan pointed dogs together and produce sable, as the tan point gene will cancel out the sable, since the sable gene has to be on the locus for "ay or "at". Not all dogs carry the "at" or "ay" gene. So you have to study coat colors in your pedigrees to see. Just because you have sable in your lines, does not mean you can produce it. 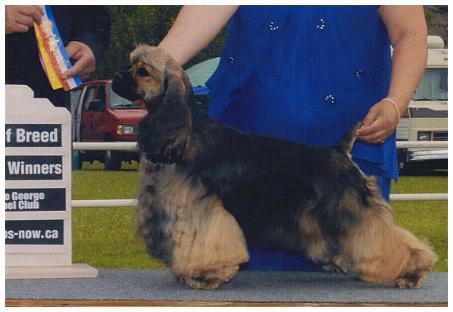 You may have sable back in your pedigree, but if any dogs coming down from that sable have tan points, (black & tan, brown & tan, tricolor ect) then you have lost the sable gene..It's gone and you will not be able to produce sable unless you breed your tan pointed dog to a sable or a dog that is carrying sable. For instance, one of my earlier girls was black & tan. Her sire was a sable. Because there was only room for either the ay or at genes to sit, she received both "at" genes and was black and tan, canceling out the sable. Her littermate got one of each and was a sable. The only way she would ever be able to produce sable, would be for her to be bred to a sable. She would not be able to produce it if she was bred to another tan pointed dog or a dog carrying tan points, because she lost the sable gene because she was tan pointed..
tan points "Gone Wild" on a cocker. pointed dog, spread out all under the coat eventually. and the sabling which is the light color will increase. 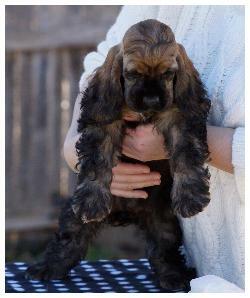 This is a black sable puppy. start to appear until the pup is a few weeks old. This is why you may see some sables that hardly seem to have much dark hair and others that still have a lot of darker hair. It also depends on how they are groomed, as a show dog, the guard hair is left in place, where often pets will have the backs shaved, and by doing this, much of the dark hair is gone and the sable often ends up looking like a buff. This dog has his back shaved , removing the dark guard hair, which makes him appear to be an ASCOB. sable gene, it would be a black & tan. spread out under the top coat, giving it a red, buff, cream, or tan color. The overlay and the dog's nose color is the actual color the dog is. In this case, he is a black sable. But because the tan points have spread out, the dog appears red, mahogany brown, buff etc. with a darker color overlay. underneath the topcoat of the dog. The correct color for the dog is the overlay such as a black sable, which actually would have been a black & tan dog, but the sabling spread out under the coat and made just the overlay black. 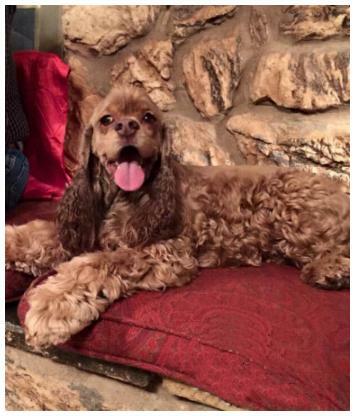 In a brown cocker, it would be a lighter tan color with the brown overlay, nose and eyerims. In partis, it would be the same; the dark areas would be sabled with a darker overlay on the spots and the color of the dog would be the overlay over the spots, eyerim and nose color. 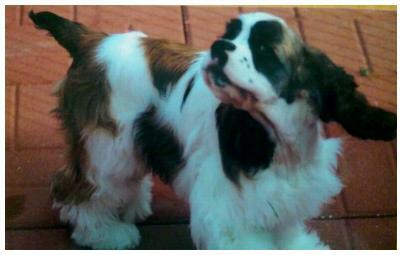 sable in the pedigree and the current non tan pointed dog. See these pretend pedigrees to see how to TRACE DOWN SABLE and also how you can LOSE THE SABLE. 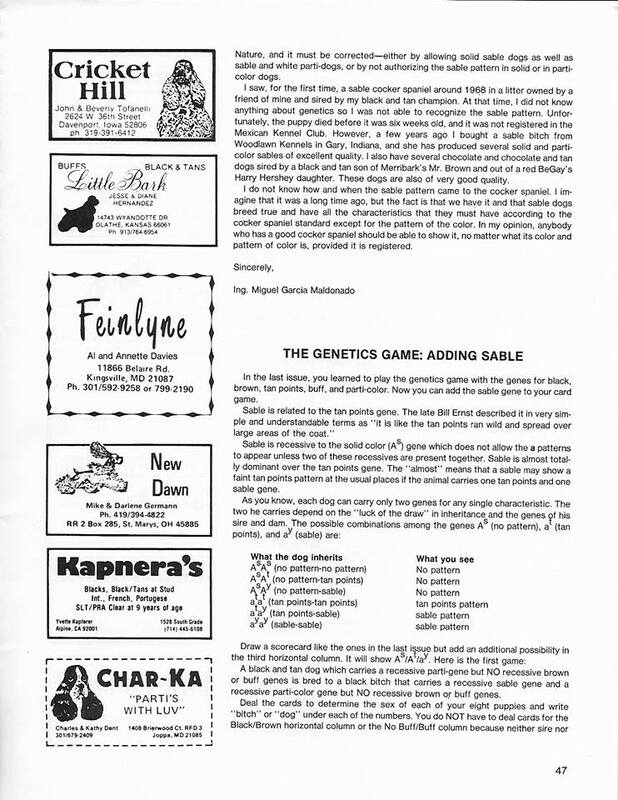 Sable to sable breeding of course, produces sable too, with no health issues associated with the sable pattern. Breed for quality.. and not just color/pattern. 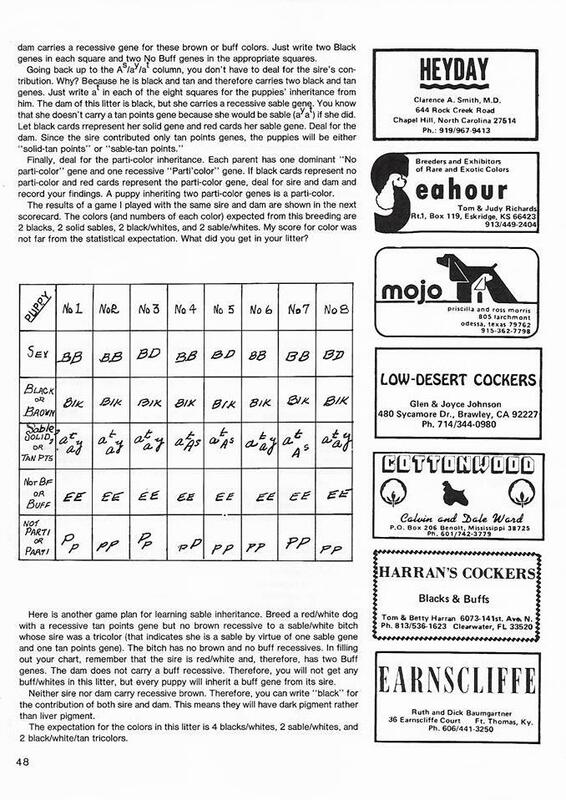 Here are 2 articles about the tan points and sable genetics that were published in one of the old Cocker magazines.